Jazz Nation Radio 108.5 is a classic jazz radio station that appears in Grand Theft Auto IV and is hosted by jazz musician Roy Haynes. Both JNR and Fusion FM are among the first jazz radio stations to appear in a Grand Theft Auto game. In Episodes from Liberty City, JNR, Fusion FM and The Journey are replaced with one station, Self-Actualization FM. If you turn to this station with Jimmy Pegorino, Phil Bell, or Ray Boccino present in the car, they will comment positively, implying that this and Fusion FM are their favorite radio stations. The "american.gxt" data file in The Lost and Damned lists a jazz standard, Billie Holiday - "Fine and Mellow" (1939), hinting that JNR was planned, but dropped, as one of the radio stations to be updated by downloadable content. 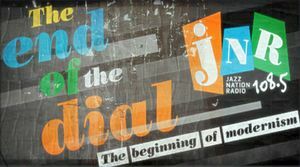 An advertisement for JNR says that it's at the "end of the dial", however it's not true since there's a station (K109) that has higher frequency than it. In the USA, FM radio broadcasts between 87.8 and 108.0 MHz, making 108.5 outside the permitted frequency range. This page was last modified on 16 December 2013, at 17:18.